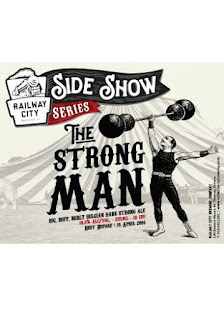 Railway City Brewing's Side Show Series Presents: The Strong Man Release! Welcome to the most extravagant show on earth with one-of-a-kind one-time brews that will blow the top off the big top tent! To celebrate their new year of new brews, Railway City Brewing Company is bringing us the Side Show Series! First in the center ring is The Strong Man! Step right up and try a taste of our Railway City Side Show Series: The Strong Man! Only the big, buff, and burly can stand up to this Belgian Dark Strong Ale with an ABV of 10.3% and 18 IBUs. Promising a nose, a sweet scent of cola and dark fruits such as cherry and plum with an underlying hint of black liquorice and bubblegum. This chestnut hued brew grazes the palate, flavours of caramelized sugars like the sweet toppings of crème brûlée will fill your mouth revealing the taste of ripe banana on the finish. This brew is set to come to Railway City Brewing on Thursday, January 21st, 2016 from 7pm to 9pm for one amazing release party! Join the party for a $5.00 per person entry fee. A limited quantity of 500mL bottles will be available for purchase along with various keg sizes.